* I admire the look on others and thought it could work for me. Excuses, excuses, excuses....yep I bought The Yellow Polish. Chanel Mimosa. 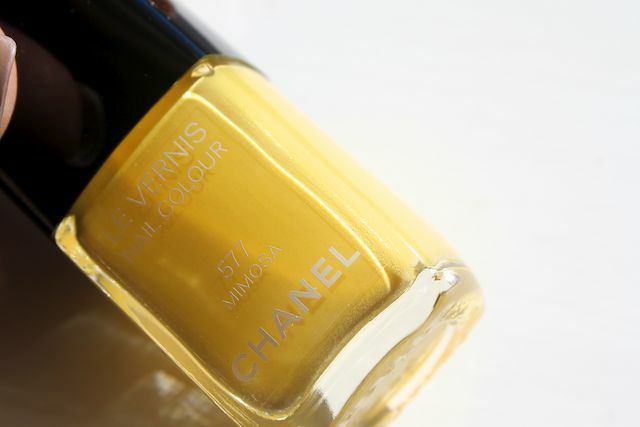 Oh in the bottle it looks so pretty...so lemony and light...surely it will be flattering? I put it on my fingers whilst I was attempting to ombre my hair - yes I really like to jump on the bandwagon years after it's rolled through town - and whilst in theory I am down with yellow polish, in reality I am not. It just doesn't suit my skintone and I am not cool enough to carry it off. I like it on other people but I detest it on myself. It has photographed quite pastel above - it's a shame that in reality it's more Colman's (mustard). The way I feel about it mirrors the way I feel about green polish...unless it's an Emerald colour it's doing nothing for me. Mimosa has just been given away on Twitter...some trends are meant to pass us by and this I need to remember! What do you think about Mimosa? Did you use bleach or dye to achieve the ombre look? You may not like it but I cannot wait to put my hands on it! Haha, the truth is that I would have preferred a pastel yellow instead of such a bright yellow but... nevertheless, I cannot find it in any store here and... I am hyperventilating! I want it still but it's sold out here. I settled on an Orly yellow. Not sure if it will look good but I'm always up for experimenting! so happy to see that you're back blogging!! I never liked any green polishes either until I picked up Essie - Absolutely Shore...it's like a muted pale pastel green with grey undertones. LOVE.